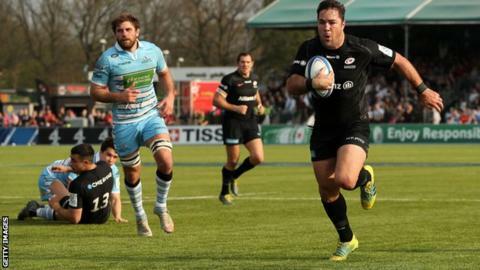 Glasgow's Champions Cup quarter-final hammering at the hands of Saracens was "tough to watch", said head coach Dave Rennie. Warriors shipped seven tries in their 56-27 defeat at Allianz Park, their third loss to Saracens this season. Rennie bemoaned his side's errors as they were put to the sword. "We needed everyone to be on song but we made too many errors, especially kicking errors. We got dominated field position-wise and [there were] too many soft defensive efforts." Glasgow made the perfect start when scrum-half Ali Price scored after just two minutes, but Saracens responded almost instantly through Wales international Liam Williams and never looked back. Having come away with a narrow 13-3 loss in the first meeting with Saracens this season at Scotstoun, Glasgow have conceded 94 points on their last two visits to Allianz Park. They have three regular season games left in the Pro14 and sit top of Conference A, with Ulster up next at Scotstoun on Friday.